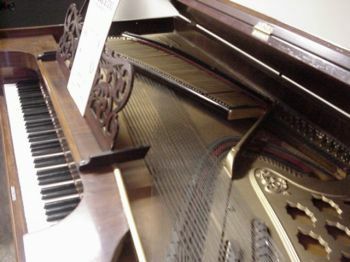 HERE IS A MAGNIFICENT & HISTORICAL STEINWAY. I do not know who actually restored this one. The problem with squares is that they are always VERY old, and they tend to be in very poor condition. I have restored one, and it was frightening. I kept wondering if I would pull it off. 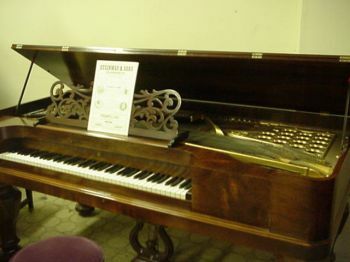 The owner was delighted with it, and his wife decided they had to pay too much for my restoration. I grabbed my cash and ran. The sound never comes back better than 80% of new with a square, and the original sound of a square was never much better than a good quality console today. My advice-- Admire them, but don't agree to restore one for a customer unless the customer clearly understands the limitations of a square. All squares had about 85 keys. The top folded back in the middle, and it was frail. The top is almost always broken and even missing. Notice how the bass strings run the wide way of the cabinet, while the treble fan around the cabinet in a semicircle. The bridge is a nightmare, and repair is very difficult. The dampers are long levers which are operated from the back end of the keys by wires at the rear of the cabinet. Sustain is accomplished by a pedal rod raising the wrack of dampers. This thing is often damaged or worn badly. 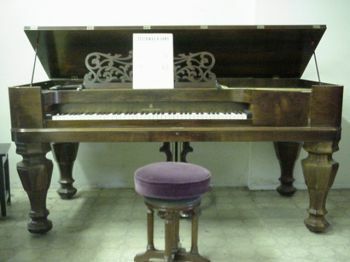 Notice the veneer of rosewood. Squares often had exceptional cabinet work, and this is why people want to see them restored. They are really an impressive piece of furniture when completed.